A machine is only as good as its controller and its motion control system, since it is directly responsible for the movement of the axes. The Linear-motor drive system is superior to a rotary motor with ball screw drive system. The linear motor drive system relies on direct feedback from a linear scale for positioning, reporting an exact position and not a theoretical position. Sodick has accumulated a rich portfolio of knowledge and expertise in linear motors including the know-how for the design and production of linear motors, best suited for various types of machines. Sodick's linear motors have achieved quantum improvement in machining speed and energy saving over those of conventional ones. The Sodick company also has focused efforts on keeping the temperature of a linear motor at a low level to maintain high thrust, and with respect to this aspect, Sodick's linear motors are far ahead of similar products. Where linear motors used on Sodick machines? The following is the outline to show where the Linear Motors are used on Sodick machines. 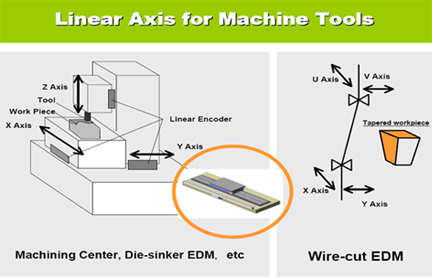 In die-sinker EDM and machining center all three X,Y,Z *axes are with Linear motor drive system and in wire-cut EDM machines X,Y,U,V axes are with Linear motor drive system. How linear motor drives work ? 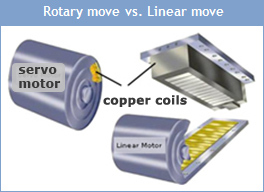 Linear drives contain the same components as a servo motor (magnets & copper coils). 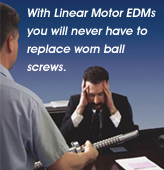 A linear motor is an uncoiled servo motor. As amperage enters the coils, it creates force that is repelled against the magnets. The motor is also the driving force thus eliminating the need for a ball screw. 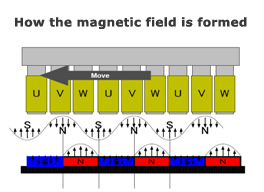 What are the linear magnets made of ? How long will be strength of the magnets lost ? The pitch of a ball screw is never perfect. When a machine is calibrated, values to correct the pitch error in the ball screws are entered into parameters that the motion controller checks. The motion controller must check these values in its calculations to assure positioning accuracy. Therefore, when a ball screw system is moved at a high feed rate overshoot and or undershoot will occur and result in positioning error and also feel vibration on the axes. The followings are the other few reasons to note which result in reduced positioning accuracy. Ballscrews will wear out, but it will not happen overnight; it is a gradual and continuous phenomenon and which may take approximately even 2~3 years, until it comes to notice and replace the ball screw one should suffer from the problems. No vibration on axes, no sticks-slips. Sodick has overcame thermal problems caused by linear motor by providing a cooling systems in the linear motor's coils, Sodick holds the patents for many solutions when it found the solution for thermal effect, attractive and outerforce problems.